St. Ann’s Warehouse fills a vital niche on New York City’s cultural landscape as an artistic home for the American avant-garde, international companies of distinction, and highly talented emerging artists ready to work on a grand scale. Founded in 1980, St. Ann’s has evolved into a world-class artistic home where artists come to make work in an open, flexible space that can be reconfigured specifically to meet their needs. St Ann’s, having completed a new theater in the heart of Brooklyn Bridge Park, has a spectacular line-up of acclaimed international productions – and is looking for Front-of-House staff! 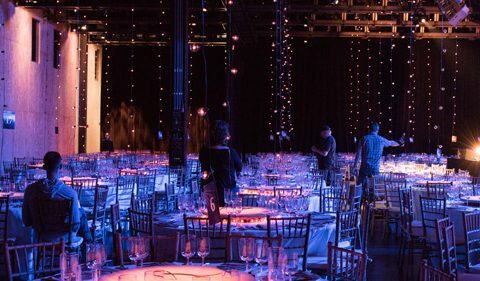 The Front-of-House staff ensures that all of our guests receive the highest level of customer service at all performances and events at St. Ann’s Warehouse. We are seeking a friendly and outgoing personality to assist St. Ann’s with its day to day operations during performances. Greeting and directing guests, and monitoring lobby traffic. Assisting with taking tickets and seating. Relaying information about St. Ann’s, upcoming shows, and building policies to guests in a clear and friendly way. Set-up and break-down of stanchions, seat labels, programs, etc. Lifting and carrying boxes, tables, chairs as needed per event. Working closely with House Manager to troubleshoot all guest issues. Providing support to House Manager with special projects as needed. This position requires availability on nights and weekends, as well as some holidays as needed. First-Aid and Fireguard (F-03)certification highly preferred. Knowledge of SquareUp a plus.